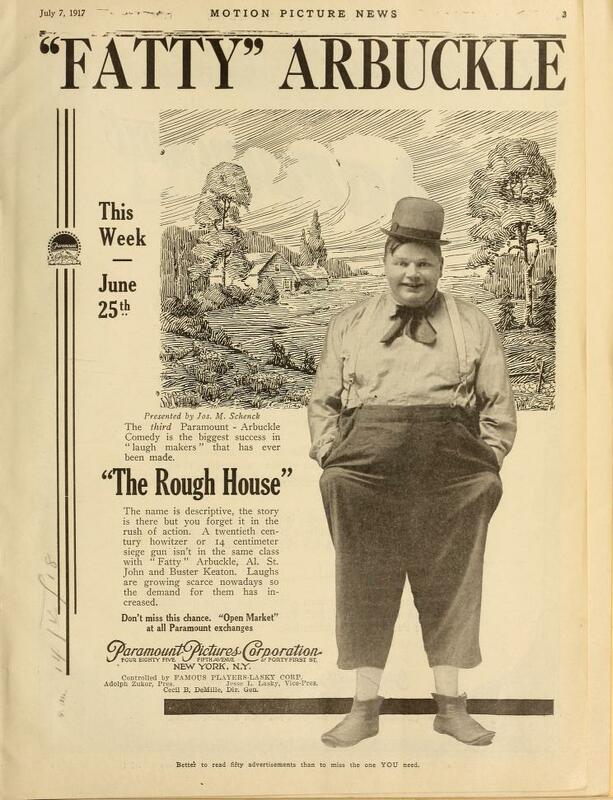 Wow, what an interesting experience is was to watch The Rough House again this week, knowing that it was 100 years ago exactly that it was released. Watching with awareness that this was Keaton's second motion picture (ever) and the second endeavor from Fatty Arbuckle's Comique film enterprise colors the whole experience. As much fun as it is to watch any movie in the right context, it couldn't save The Rough House from being a bit of an odd film. It is odd because in some ways (plot, theme, cohesion) it is somewhat poorer an entry in the Keaton / Arbuckle cannon, while in others (cinematography, clarity and cleverness of gags) it may be somewhat better. Ultimately I think the film is important not so much for its independent value as a piece of artistry. . . but rather for all the things it speaks to without intention. 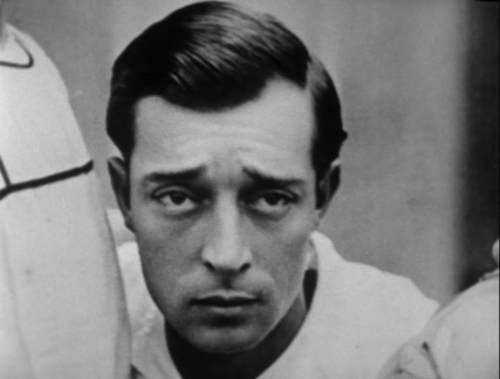 For starters, the Buster Keaton we see in TRH appears to be a much bigger screen persona than he was just a couple short months ago. Unlike the blurry, haphazardly-filmed young vaudeville act on display in the Butcher Boy, this Keaton is now photographed head-on, zoomed in, with shots that announce his presence. Just as in The Butcher Boy, Keaton enters the film for the first time a quarter of the way through with a solo stunt - probably of his own design. But unlike in TBB, here in TRH, the bit feels like a celebration of talent: an entrance. (Or is it just me that sees this?) Shortly after his entrance, we are treated to Keaton facing the camera in a 3/4 shot, rocking side to side and smiling and flirting with a delighted maid, played by Josephine Stevens. It is a sweet moment that both reminds us of how far he's come already, and how early in his career he still is -- having not yet made the concerted choice to use only his famous deadpan on screen. 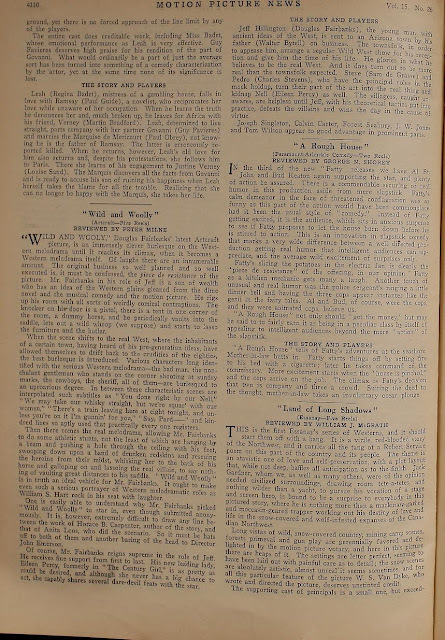 So, the story in June 1917 -- I mean the larger Keaton story, not the film plot -- continues with his clear inculcation into cinema. With The Rough House, Keaton has arrived. But, though the picture gives the impression of an important slot for Keaton on Arbuckle's team, Arbuckle is just as clearly still the main man. Having admitted as much elsewhere on the blog, I have no hesitation in saying that I am not a film scholar, but a dilettante. I have often felt at a loss that I don't have access to an academic library, research sources, or great professional connections to assist me and am often flying by the seat of my pants when I blog; however, sometimes those pants stumble upon the extraordinary. I recently found an incredible resource called the Media History Digital Library, which contains an extensive, digitized, searchable bank of publications from throughout cinematic history. To call it a treasure trove is an understatement. It is the coolest thing I've ever seen. I looked through a number of publications on the site, such as Motion Picture News, Moving Picture World, Variety, Billboard, Moving Picture Weekly, Photo Play Journal -- some leaning more toward industry data and others more toward fan mags. What I found was that when searching industry publications from April - June of 1917 for the name "Arbuckle" you get a lot of hits. When searching for "Keaton," the pickings are much slimmer -- maybe one "Keaton" for every dozen or more "Arbuckles." There's little doubt that Fatty was a well-known persona, and if not quite a "movie star," certainly a major figure in the industry. Notes and tidbits on more than just his films appear in these publications - his wife, his pastimes, his whereabouts are discussed. Keaton, when mentioned at all, is noted as a player in the Arbuckle film at issue. (I didn't search on Al St. John; which I probably should have. It might have been interesting to compare Keaton's press with St. John's as the latter had been in pictures a lot longer. Maybe I'll remember to do that next time.) . In any case, although Fatty seems to be a generous performer / director, sharing the screen readily, we can hardly escape the feel that we are still in an Arbuckle Film. And TRH seems typical of Arbuckle -- in good ways and bad. The film enjoys Fatty's boyish energy, charisma, great creativity and juvenile spirit. It is also marked by a minimal attention to story. I'm not sure whether it is my fault, as a modern viewer, that I desire a story to make sense? But another thing this film seems to speak to unintentionally is the different entertainment standards separating a 1917 audience from a viewer in 2017. I think I have a fairly reasonable tolerance for chaotic pointless fun (at least when that involves Al, Buster and Fatty) -- but I truly found this film's lack of coherence to be problematic. Contrarily, the buzz about the picture from contemporary (1917) sources seemed quite positive. 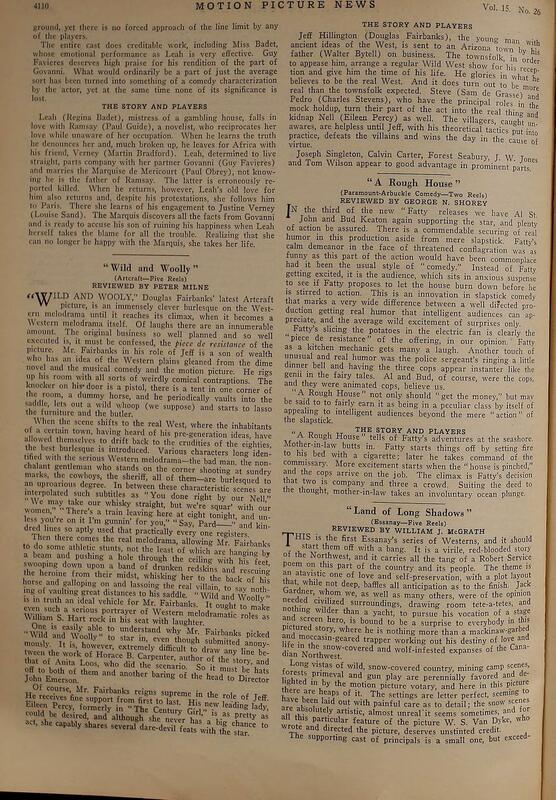 Here's one from the Motion Picture News reviewer, George N. Shorey who not only loved it but apparently had no trouble picking through and finding a plot that satisfied, which is summarized as such: "tells of Fatty's adventures at the seashore. Mother in law butts in. Fatty starts things off by setting fire to his bed with a cigarette; later he takes command of the commissary. More excitement starts when the 'house is pinched' and the cops arrive on the job. The climax is Fatty's decision that two is company and three a crowd. Suiting the deed to the thought, mother-in-law takes an involuntary ocean plunge." Unfortunately, the reviewer refers to Buster as "Bud", repeatedly! I guess we can forgive him if for no other reason than it underscores that Keaton is still very much a newcomer to the industry. More than just enjoying it, though, Shorey pays the complement of comparing it ("a well directed production getting real humor that intelligent audiences can appreciate") to your run of the mill slapstick. He thinks of it as an "innovation" and in a "class by itself". This is not just a compliment to the enjoyment value of The Rough House, but to its cinematic contributions as well. Odd. Several bits in the film that feel particularly intelligent bear Keaton's stamp. This includes the camera trick / edit Shorey was impressed with where the boys as cops show up magically when summoned. I also see Keaton's style in the scene where the cops emerge on a subway portal and then scramble down the embankment (anticipating the famous sequence in Seven Chances). The subway bit was visually funny to me; when they emerge at 242nd street, it felt absurd and I laughed. But then I thought about it. Why is this funny? I truly have no idea. I had to see if I could find out what the joke was. A bit of searching on the internet for the meaning of this bit turned up no real answers, but I did learn that this was/is a real subway platform. (Of course, at this time, Arbuckle's studio was located in Manhattan). The 242nd Street station, it seems, was the northern terminus for a route connecting lower manhattan with The Bronx. (Here's a nice article about the West Side Line - IRT). The station where the cops emerge would have been the end of the line and viewers at the time probably were in on more of that humor than a modern one would be. There is something silly about the action suddenly migrating from a remote vacation lakeside spot to having three bumbling cops surface in the Bronx. Yes, it's funny. But its a Keaton kind of funny. Others have suggested that Keaton in fact did co-direct this picture (uncredited). Though I can't add any validity to that, I can certainly speak to a perceptible jump in Keaton's apparent involvement on display in The Rough House, compared with what could be perceived from The Butcher Boy, his first. Keaton's now been on the scene in New York as a film actor for two months and is beginning to feel like a pro. I can't wait till I get to research and review the next picture for the blog, which I'll be doing in about 2 months (His Wedding Night). In the meantime, happy viewing! Interesting to read a period review; it's impossible to view a movie today the same as an audience would have at the time. I agree, TRH has a weak plot unless you view it more like "A Day In The Life..." Of course, I enjoy seeing "Bud" in anything. Thanks for that library link-- what a resource!! See you in August!